Macworld Expo's keynote speech delivered the biggest news of Tuesday with updated information on the long-awaited OS X and several major hardware and software debuts. Below is a roundup of the news stories from Macworld, MacWeek, and MacCentral. We have a ship date for OS X: March 24, 2001. The new operating system will cost $129. Over the course of the keynote, Jobs spoke about the features in the core of the operating system, moved on to its graphics-rendering capabilities, then finished by demoing new features in Aqua that were prompted by user feedback. Noteworthy points in the OS X portion of the keynote were an emphasis on the improved architecture in Darwin, much of which is similar to Unix. Jobs said, "our goal is to never have Darwin crash," and followed up by pointing out that OS X was "Unix's twin brother" and by giving a tour of Aqua's latest interface addditions, including improved window management and an Apple menu, which permits users to sleep or shut down the system at any time. After the software pyrotechnics, Jobs introduced a new line of G4 machines, all of which feature CD-RW drives. The four models come in a variety of speeds from 466MHz to 733MHz and offer an array of graphics-rendering features that should make creating or consuming multimedia much more enjoyable. 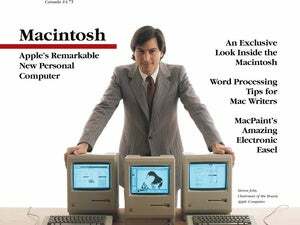 After addressing and discounting the idea that the PC industry has reached a stalemate, Jobs introduced the idea that we're entering a "third golden age of personal computing," one that positions Apple as "the digital hub of the digital lifestyle." Two applications that will do so are iTunes and iDVD. iTunes is Apple's music software package, a free all-purpose audio program that lets users manage their digital music files. Users who have Apple computers with CD-RW drives will also be able to burn their own custom CDs quickly and easily. iDVD, which will come on all G4 computers with the "superdrive" enabling them to read and write DVDs, helps people compose and burn their own DVDs. Ending the keynote with "one more thing" has become a ritual. This time, one more thing ends up being the new Powerbook G4 laptop, a streamlined portable computer with top-of-the-line specs. The new machines are expected to ship at the end of January. In other news, Macworld announced their Editor's Choice awards Monday night: you can peruse the winner's circle or download the Eddys database to your Palm. As always, there are photo galleries courtesy of MacWeek and MacCentral that showcase some of the sights on the Expo floor.